Understand your breed’s particular susceptibility. Some dog breeds are more prone to the cold than others, while some breeds adapt extremely well to the cold: It seems that almost every dog walk that I go on during the bitterly cold days are with the dogs that LOVE the weather. That includes the Siberian Huskies, Malamutes, Shepherds and Newfoundlands. The dogs that don’t go on dog walks with me on those cold days are the Greyhounds, Boxers, Dobermans and toy dogs. Those breeds seem to wait until the warm days to enjoy a walk with me. Provide appropriate shelter. It is best if your dog can remain indoors throughout winter, going outside for exercising and answering nature’s call only. This will ensure that your dog doesn’t get cold while you’re away. Young puppies should not be left outside as they don’t have the ability of older dogs to keep themselves warm outside. Be sure that bedding is warm and well placed. Bedding is an important part of keeping a dog warm through winter. If your dog sleeps on the floor or somewhere with drafts, place the bed up off the floor. A custom-made bed with cushioned insert, blankets, and old clothing make good, warm bedding. For old and arthritic dogs, consider using a heated dog bed, or like me, just let your dog have your bed. Use canine clothing for particular dogs and temperatures. Canine clothing can help to keep your dog warm through winter, especially for small or toy dogs, dogs without long hair and old or sick dogs. One of the key signs of a cold dog is shivering, just like humans. Dog jackets and sweaters can be purchased for any sized dog. For wetter winters, you might like to attach a rainproof layer over the top. You can also use boots when out dog walking …especially when walking on snow or ice. Salt’s an irritant on dog paws and the boots will keep them free from this. Be sure if you have a dog walker or pet sitter that they know that you have a jacket and boots for your dog and where they are located. Also be sure that they know at what temperature you want them used. Many dogs don’t need them during the days that are not quite so cold. Grooming in Winter Months. Avoid trimming, shaving or cutting your dog’s hair because a dog’s full weight coat is his source of warmth during winter. But, it is important to maintain a good grooming regime through winter as matted hair is less efficient at keeping out the snow and cold rain, and does not insulate the dog as well. Keep the hair around paw pads well trimmed. This will help prevent ice and snow balling up between foot pads. If your dog doesn’t wear dog boots, be sure to clean off the salt and snow after every walk. Only bathe indoors and make sure your dog is completely dried before letting him outside. Cold Weather Dog Walking Tips. Take your dog for shorter walks when the weather is severely cold. Don’t try to take your dog on the same length walks as during warmer weather. A shorter walk can still accomplish enough exercise and relief breaks without causing your dog (and you) to become too cold. Be sure you let your dog walker or pet sitter know that they need not take your dog on the full walk in the bitterly cold weather. Frostbite can be a problem for some dogs. Check the ear tips and tail tips in particular – if they look and feel cold, appear white, red or gray or are dry and hard, then frostbite may have occurred. If you think your dog has frostbite, wrap those areas in blankets or towels to warm them gradually and see the vet immediately. 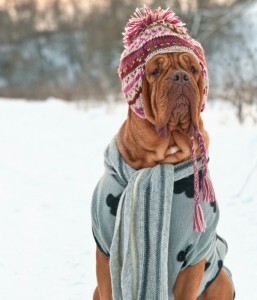 One last thing….IF YOU FEEL COLD, CHANCES ARE SO DOES YOUR DOG. Have a safe and happy winter out walking with your best friend.